We celebrate the upcoming solstice with the music of Helicon, as they join us for their annual visit to our studios. 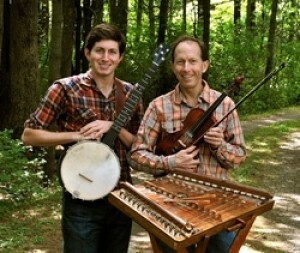 You will hear Brad Kolodner on banjo and fiddle, Ken Kolodner on hammered dulcimer and fiddle, Robin Bullock on guitar, cittern, piano and mandolin, and Chris Norman on wooden flutes, penny whistle, and bagpipes. Helicon will play for two performances this Saturday at Goucher’s Kraushaar Auditorium.